The value of the German kitchen furniture market (at retail prices) was about Eur 4,200 million in 2009. The relevance of buying groups is the major difference, in terms of distribution channels, between Germany and the other European countries. 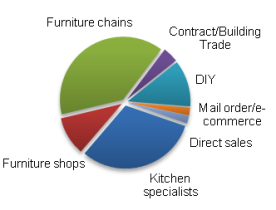 Both large chains and individual shops may be formally organized in buying groups, considering the kitchen market specifically, buying groups can be classified into three categories: kitchen dealers associations, furniture dealers buying groups, furniture dealers associations. In Germany one of the oldest buying groups is EK Servicegroup which was founded in 1925, while A plus, established in 2008, is one of the most recent group. CSIL report Kitchen furniture distribution in Germany offers an overview of the kitchen furniture retail industry in Germany and it includes short profiles of major kitchen furniture distributors broken down by kitchen dealers associations, non specialized buying groups, furniture dealers associations, independent furniture chains, mail order, e-commerce and DIY. Kitchen shares in a selection of major furniture outlets, as well as the geographical location of distributors nationwide are also given. Analysis of home furniture imports by country, an overview of top German kitchen furniture manufacturers, and product trends (cabinet doors, worktop materials) are also provided. Addresses of about 120 companies mentioned in the report are included.